Special Correspondent Ken Brookes visits the Imperial War Museum’s Duxford Airfield near Cambridge, UK. He also took the photographs. A key fighter airfield during the Second World War and now part of the Imperial War Museum, Duxford rates among the top two or three airshow locations in the United Kingdom. Unlike most of its rivals, it features several shows in the course of the year and its ‘Flying Legends’ extravaganza has become a legend in itself. 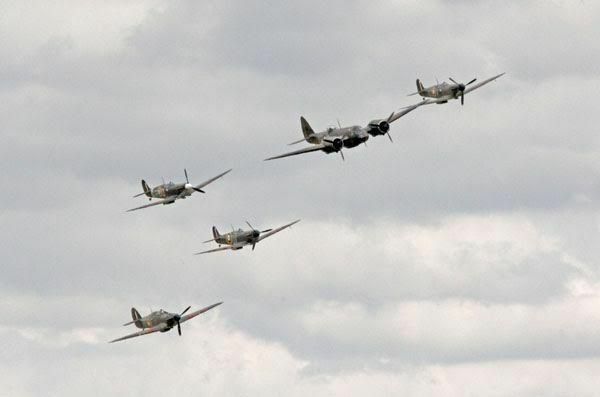 For example, whilst Fairford’s famous Air Tattoo reputedly had trouble putting a single Spitfire into the air at its 2015 event, Duxford almost casually fielded around a dozen, in formation, accompanied by a Hurricane and followed by their biplane predecessors Hawker Fury and Nimrods, and not one but three Messerschmitt 109s. Elsewhere were a series of the aeronautical set pieces for which Duxford is justly famed, and even some legendary transports for old-time business travellers. Facing on to the apron and backdrop to the display was part of the extensive collection of historic airliners preserved and restored by the Duxford Aviation Society. They include a BOAC Vickers VC10, a Monarch Bristol Britannia and a BEA Airspeed Ambassador. Many other historic aircraft crowd the exhibition halls, not least the American Air Museum, where on this occasion the Boeing B29 Superfortress had been moved outside during refurbishment. With clear blue skies and a few fluffy clouds, we were treated to a feast of aerobatics and formation flying. The 3-hour flying display led off with a sky-full of assorted Supermarine Spitfires, both Merlin- and Griffon-powered and supplemented by a solitary Seafire and just one Hawker Hurricane. They were followed by a quartet of US naval fighters, including two Vought Corsair variants, a Grumman Wildcat (shown as a Royal Navy Martlet) and a later Grumman Bearcat and Avenger. More setpieces followed, a Curtiss fighter formation featuring two ancient P36 fighters preceding more “modern” P40s, then “Sally B,” the Boeing B17G Flying Fortress escorted by a virtual squadron of North American P51s with more Rolls-Royce Merlins. Billed as “The Luftwaffe” were an interesting group, a Bucker Jungmann trainer, three Messerschmidt 109s (but only one, a genuine Luftwaffe Me109G, the others Merlin-powered from the Spanish Air Force) and last but by no means least, a Junkers Ju52/3M transport, of which nearly 5,000 were built. Another highspot was the recently restored Bristol Blenheim 1, formatting with three Spitfires and the Hurricane. 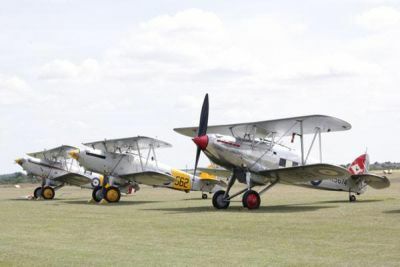 Biplane fighters of the early 1930s were represented by a pair of Gloster Gladiators and three Hawkers – two Nimrods and a Fury. Finally, and most spectacularly, was the grand “Balbo” finale – a formation comprising everything flyable from the entire airshow – including one of the most important transport aircraft ever, the Douglas DC3, which revolutionised passenger transport in the 1930s and is still operated today in many parts of the world, in this case by Breitling.